A legendary name in Southern country rock circles, The Ozark Mountain Daredevils came out of Springfield, Missouri in the early 1970s and soon won a reputation for their incredible multi-instrumental guitar playing skills and sure-fire song writing abilities. Their independent spirit brought them to the attention of Brewer & Shipley managers Paul Peterson and Stan Plesser who made they sure the band served their apprenticeship in the toughest coffee houses and ale bars in the locale before entrusting them to the top notch team of producers David Anderle and Glyn Johns. 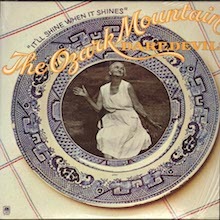 The Ozarks airtight harmonies and rapid mastery of studio sound resulted in a trio of terrific albums at the outset, all of which we have here for you, and gained them chart success in the shape of the hit singles 'If You Wanna Get To Heaven' and their signature number, the lovely 'Jackie Blue'. Featuring key players like Buddy Brayfield, Randle Chowning, John Dillon, Mike ‘Supe' Granda, Bill Jones and Steve Cash in their retinue the Ozarks imprint has become a byword for virtuosity and classic country. The beauty of it is that they are not so well known anymore, outside of the cognoscenti. Our catalogue gives everyone a chance to rectify that and rediscover a band that slipped through the cracks yet now sound like a cult classic. After cutting their teeth as Family Tree in the clubs and theatres of their native Springfield Steve Cash, Randle Chowning and friends made a demo tape that impressed John Hammond who was looking for new talent to join his roster in New York City. When that didn’t materialise the same tape made its way to Peterson and Plesser who saw their potential and gave them a residency at the Vanguard in Kansas City. Word of mouth did its best thereafter and following a support stint with Loudon Wainwright 111 and Brewer & Shipley they convinced A&M's Jerry Moss to snap them up. They were then sent to England to record their debut album, The Ozark Mountain Daredevils (sometimes known as The Quilt Album on account of it’s down-home patchwork quilt cover). 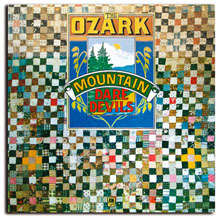 Whether or not that quilt served notice of the Ozarks eclectic ability the music within certainly did. 'If You Wanna Get To Heaven' was a simply irresistible radio hit that then became a solid 25 smash on Billboard’s Top 100. The entire recording caused a sensation in new country circles. The combination of harmonicas, harpsichord, fiddle, dulcimer and glorious four part harmonies pushed the group up the pecking order and made a huge impression in Europe also, especially in the UK where the pub rock/pre-punk crowd made it big seller at discerning import stores, not least because the OMD boys provided the London press with mighty fine copy and charmed all those who came into their orbit. Stand out tracks abound. Randle Chowning’s harp driven 'Country Girl' has the kind of open air and blue skies majesty associated with early Eagles hits like 'Take It Easy' while Steve Cash’s 'Chicken Train' is pure country joy. One listen to this disc will convince you that the Ozarks had a special gift – they are certainly a match for any more famous kin like The Flying Burrito Brothers and don’t take themselves too seriously either. The same Johns/Anderle production team coaxed another classic out of the boys on 1974’s It’ll Shine When It Shines. To get the appropriate atmosphere for their songs the band now cut their tracks pretty much in real time in their pre-Civil War rehearsal space. Johns and Anderle were set up in the garden with a mobile truck-recording unit and the results are sensational. Every song here resonates with country air. The swampy 'E.E. Lawson' is a favourite but then so are 'Look Away' and 'Kansas You Fooler'. Best of all is the Steve Cash/Larry Lee tune 'Jackie Blue', sung by drummer Lee in a magnificent high register. Adored at the time the song has got long legs. The Smashing Pumpkins covered it on their Gish album and Shawn Lee did the honours a few years hence. It’s still a regular request on FM radio. While many bands struggle to match such highlights the Ozarks improved again on The Car Over The Lake album, which has a feel somewhat reminiscent of Little Feat in their pomp. Down to a solid sextet, they added specialists where necessary. Weldon Myrick plays the pedal steel guitar, Nancy Blake the cello and Farrell Morris chimes in with orchestral bells. Recording in Nashville, the Daredevils combo of Californian soaked bliss and front porch laid-back strums add up to the most pleasant listen imaginable. Their Southern rock roots are all over 'Keep On Churning' and 'Leatherwood' while the typically zany 'Gypsy Forest' has enough time changes to keep everyone guessing. What the Ozarks didn’t do was compromise. If that cost them dear at the time in retrospect it’s only cause for celebration. They refused to re-settle in California for one thing and deliberately avoided cloning their hits. More power to their elbow because if they’d done either or both of those things they may have sacrificed their credibility. We love them just the way they are and we also particularly enjoy their Best Of – 20th Century Masters – The Millennium Collection. This must have 12-track compilation gathers all the highlights mentioned above with room for other southern delights like 'Homemade Wine' and 'Road to Glory'. If these don’t put a spring in your step and have you singing along – 'Jackie Blue' must be one of the all-time earworms – then check your pulse. Of course we know that won’t be the case. Get some Ozark Mountain Daredevils into your life, open the windows and shine along with their irresistible Missouri music. The group's first album is also their most successful rock effort, an ebullient country-rock collection that sounds a lot like the Flying Burrito Brothers of around the same period, with richer production and more of a sense of humor than the Burritos had, and highlighted by some excellent songs ("Country Girl," "Road to Glory," "If You Wanna Get to Heaven"). Randle Chowning's "Country Girl," in particular, is amazing as a harmonica-driven near-twin of the Eagles' "Take It Easy" that you sort of wish ran for ten minutes instead of just three. Steve Cash's jew's harp/harmonica showcase "Chicken Train" brings the band back to its roots. The Ozark Mountain Daredevils' third album for A&M continues their good-natured Southern chooglin' with hints of a newfound mid-70s AM pop vibe. 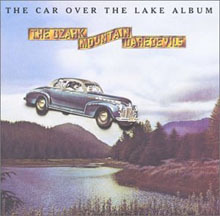 Although it was recorded in Nashville, The Car Over the Lake Album has a distinctly Californian vibe on several tracks, particularly those written and sung by drummer Larry Lee, whose contributions could ride along "Ventura Highway" with any of America's recordings. Despite this warm Beach Boys influence, the album is still a Southern rocker, evident on "Keep on Churning," "Leatherwood," and the slightly goofy "Gypsy Forest." The hard-rockin' push of "If You Want to Get to Heaven" is nowhere to be found on this album, but the laid-back porch-sittin' hum of "From Time to Time" and the spectacular "If I Only Knew" acts as an acceptable substitute. 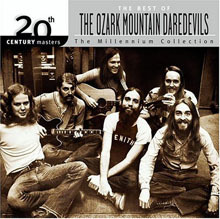 20th Century Masters - The Millennium Collection: The Best of the Ozark Mountain Daredevils collects a dozen easygoing country-rock hits from the band, including "If You Want to Get to Heaven," "Jackie Blue," and "Homemade Wine." 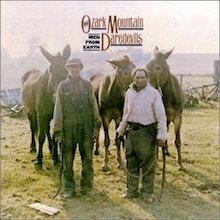 Strong album tracks such as "Country Girl," "Spaceship Onion," "Road to Glory," and "Following the Way That I Feel" give the collection some added depth, even if it isn't as comprehensive as Time Warp: The Very Best of Ozark Mountain Daredevils. Nevertheless, it's a solid, if somewhat too concise, overview of this somewhat overlooked band's output. The group's last fully succesful record, mixing soft, romantic sounds ("You Know Like I Know") dressed up in restrained, tasteful orchestrations with harder country sounds ("Homemade Wine"). "Fly Away Home" is probably the best rock number here, and also has room for some very pretty noodling on the mandolin. Although it omits three songs from the far less comprehensive (and deleted) 1983 12-track Best Of, and doesn't include any live or post-A&M music, this 2000 release stands as the final word on the Ozark Mountain Daredevils' career. Cherry-picking 21 tunes from their five studio album stint circa 1974-1978 -- with the lion's share coming from their first three albums and only three selections from the final two -- this is pretty much all you'll need from the under-recognized band that worked in the '70s country-rock shadows of Poco and Firefall, but weren't as dependable or pop savvy as either. In fact, their biggest hit, the Hall & Oates, blue-eyed soul-styled "Jackie Blue," was so atypical of the band's characteristically down-home approach that it ultimately may have been more damaging to their career than if they had clicked with a song more representative of their crisp, rural country pop/rock. As enjoyable and pleasantly organic as they were, the group lacked a distinctive vocalist, direction, and most importantly great songs. This collection focuses on their less commercially rocking, more rootsy side, and as such it's a consistently listenable, predominantly chronological compilation that is all any but the most die-hard fan will ever need. An extensive essay (including quotes from bandmembers) and rare photos in the disc's 16-page booklet sweeten the pot and make this as definitive an overview from a talented also-ran outfit as necessary. 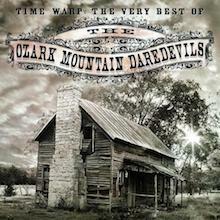 Like its closing title track, the Ozark Mountain Daredevils lived in a stylistic time warp, comfortable within its own limitations and unwilling -- but not unable -- to break free of them. 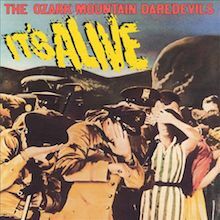 The Ozark Mountain Daredevils left A&M Records in 1978, and in lieu of the obligatory best-of compilation, which would follow a little later, the label put out the double-LP live album It's Alive. By this time the lineup was an eight-piece, with lots of guitars and a full-time keyboardist (Russell Chappell) and mandolin player (Jerry Mills). The original vinyl release left something to be desired in terms of immediacy, but the 2004 CD reissue solves that problem -- there's still less audience interaction than would be ideal on most live albums, but the band's sound is now fully in-your-face, running the gamut from soft rock to bluegrass to country blues, all of the instruments and the singing in sharp relief, and they never sacrifice energy for polish -- indeed, as the album progresses, the sound moves a bit more toward the raw and freewheeling, culminating with the encore of "It's All Over Now." One suspects there was a certain sweetening of the harmonies, especially on songs like "You Know Like I Know" and "Fly Away Home," while other songs, like "Following the Way That I Feel" and "Horse Trader," sound pretty raw and honest. The big hits are all here, with a crunchy-textured "Jackie Blue" and "If You Wanna Get to Heaven" saved for the end, but the best number here is an acoustic version of "Satisfied Mind" cut live in a men's shower backstage at an arena in Springfield, MO. The 1997-released Archive Alive concert from early in their history is rougher and more viscerally exciting, but this double-LP captures what concert work was like in the late '70s and represents a big chunk of the group's repertory, preserved from several gigs along their 1978 tour through Missouri and Kansas, close to their roots.